Paslode 902400 is a lightweight finish nailer that is easy to move around during the work. It is a superb machine that uses easy to load fuel cell and lithium-ion battery to function. It only weighs around four and a half pounds. You can use it for small and big jobs at your home or workplace as it is built to take on all kind of nailing jobs equally well. It comes with an efficient battery charger which charges the battery to hundred percent within an hour and allows you to drive up to six thousand nails with a single charge. As its name tells that it an Angled Finish Nailer you can expect that it is specially designed to reach the corners and deal with the difficult surface areas where usual nailers don’t provide a clear line of sight. It is engineered to sustain the tough environment with its solid built. Which means it is capable of providing you with the best nailing results for years. The handle is specially designed to absorb the shocks and jerks and allow you to insert the nails steadily. If you have used other nailers in the past you will notice that Paslode 902400 allows you to work with more comfort as you’ll find that your wrist and fingers are well positioned while carrying out the nailing chores with this nailer. It comes with the depth adjuster which gives you the option to decide how deep you want the nails to go into the surface. Just like most of the other finish nailers you can load its magazine with multiple 16 gauge nails. It works well for nailing work related to wooden doors, shelves, and windows. It has an efficient mechanism for clearing the nail jams and you don’t need to use an extra tool for the jam clearing. If we compare it with the air-powered nailers it can be easily seen that not only this nailer has a much lower price – it also allows the user to work with increased comfort. Its lightweight and perfect ergonomics allow the user to use it for longer durations and reach those areas of the surface for nailing which other nailers might not cover. 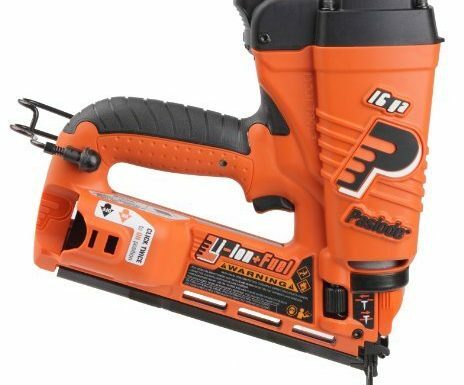 Its portability is obvious due to its cordless design however that does not compromise its performance as it conducts the nailing with perfect power. In this way, whether you have to keep working for longer durations or complete a small task you are good to go with this amazing nailer. To improve the life of Lithium-ion batteries it is advised to remove them from the tool when your work is finished or you intend to take a longer break before starting the work again.